Deep in the bayous of southern Louisiana, an ancient mansion called Beau Rivage sits empty and abandoned. Arceneaux family members built the house and lived there for two hundred years. The house is inherited by Callie Pilantro, a down-on-her-luck granddaughter of Juliet Arceneaux, its most recent owner who died there a few months ago. Strange things begin to unravel as a mysterious child appears and disappears at will inside the house, Callie finds a family graveyard in the woods that creates more questions than answers, and she discovers that even the walls of the mansion hold long-forgotten secrets. Confronted by strange events she doesn’t understand and a little girl who speaks in riddles, Callie struggles to find the secrets of Beau Rivage even as someone is determined to keep her from learning them. 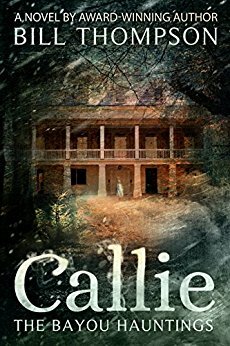 The Bayou Hauntings-Callie will keep readers guessing as they follow the new owner of the Civil War plantation home until everything comes into focus one eerie night. Will it be too late for Callie?  Archived in Books, The Bayou Hauntings. Sign up now for advance previews and a FREE book!